It's that time of the month again. 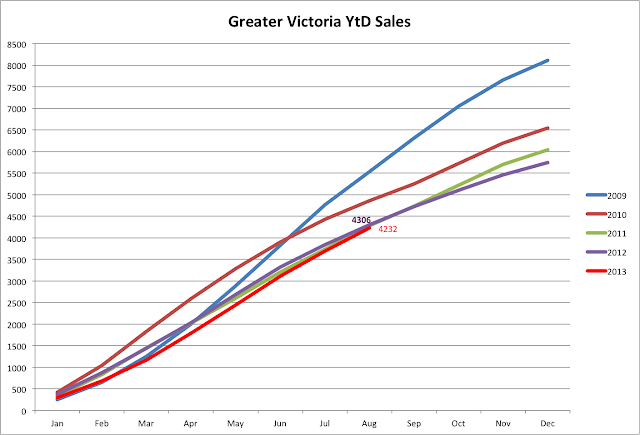 The time when the VREB optimism bunny is jumping up and down because our sales have improved from dreadful to average. So is the market picking up or is this just another bump on the road down? Well let's take a look. Sales first, where indeed things are looking up. The best summer in 5 years! Well that may be but 2013 is still the worst year in 5 years. Perhaps next month the market will no longer be the worst. Unless we hit more regulatory tightening we should surpass 2012, in which the slowdown didn't really hit until the latter half of the year. There will likely be a minor hit when the last of the ultra-low pre-approvals expire, but I don't think it will have the same magnitude as the intervention last year. On the other hand, the hounds are getting restless again and rumours of more OSFI tightening are starting to appear. And prices? Flat as a halibut. The VREB is excited about as 12.5% increase in the townhouse median, but it's nought but noise. But do we recall our skew factor? Turns out when I wrote that last article I screwed up my X axis and left out the last couple months. 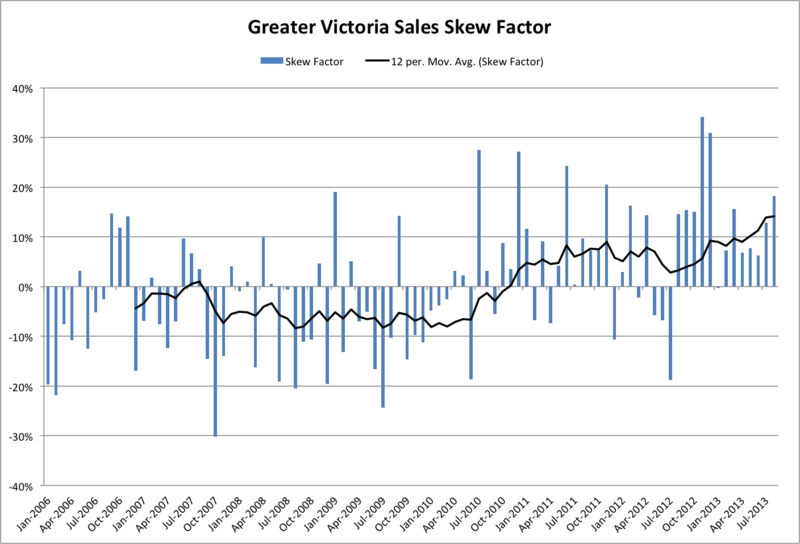 Those happened to be the ones where the skew factor increased even more (the VREB paid me off to leave those months out the first time). It's pretty severe at the moment as it turns out. Hard to say much about magnitude, but this could be hiding the actual decline in prices. Thanks to Koozdra for continuing to provide the data to make this graph. Great graphs as always. Thanks! Press release from VREB a laugh as always. Sold Nokia stock today. One of my worst investments ever. Thanks MSFT for reducing a 70% loss to a mere 50% loss. Thankfully I have made some better decisions too! Thanks for the updates Leo! The graphs you are putting out are awesome. Ditto ... Fantastic graphs, Leo! Np. Any particular graphs you want to see, let me know and I'll see what I can do. Info: I saw your request. Interesting idea but I don't have the time to scrape the data together at the moment. If you can find me the data I'll put something together. Time for another round of rule tightening. Low interest rates makes too good consumers of us all. This is what I have for sales of condominiums and detached homes in the core for August 2013. The median Sales to Assessment Ratio had condominiums in the core selling at 97.1% of their assessed values. An improvement from August 2012 when condos sold at a median of 93.7% of their value. A 4% increase. Average Sale Price is up from last August from $323,186 to $334,627 or 4%. And so is the median price for a condo in the core. Up a staggering7% in one year from $262,700 to $280,000. Detached homes prices were mixed from August last year to 2013. With homes selling at a median 100.3% of their assessed value or roughly 2% more than they did last year. The average selling price up a mind boggling 7% from $611,653 to $653,763. Yet the median seems to have imploded falling 3% from $575,000 to $560,000. Things that make you go hmmmmm! And the time it took to sell a home increased 20% to 54 days. Yet 26% more homes sold in August 2013 for a total volume in the core of 149 detached homes. The way I look at it, Condo prices are up 4% from last August and the market for detached homes in the core is shallow showing that while more costly homes are selling to day depending on where you buy in the core you will pay less than last year or more. If you buy in Saanich West you'll get a deal. Buy in Oak Bay or Victoria City - just remember to wipe off the bulls eye on your forehead after you sign. I have an idea that might help eliminate some of the skewing from your data, if you have the time and are willing to give it a go. Your numbers have been skewed higher for a number of months due to a higher than normal number of well maintained/recently renovated houses selling in the core areas. A comparison of newer houses vs newer houses in the core and a comparison of older houses vs older houses in the core might be valuable. I'm assuming that newer houses are, on average, in better condition than older houses. Comparing March and April 2013 to July and August 2013 would be most valuable since it keeps all of the data within the year 2013. For newer houses, let's go with 1998 and newer. For older houses, 1970 and older, if that gives us enough data. House size as well as lot square footage would have to be kept within a reasonable range. 1998 and newer houses sold in March and April vs 1998 and newer houses sold in July and August. 1970 and older houses sold in March and April vs 1970 and older houses sold in July and August. As Leo's charts point out, there has been considerable upward skewing of the median and average since about March of this year. 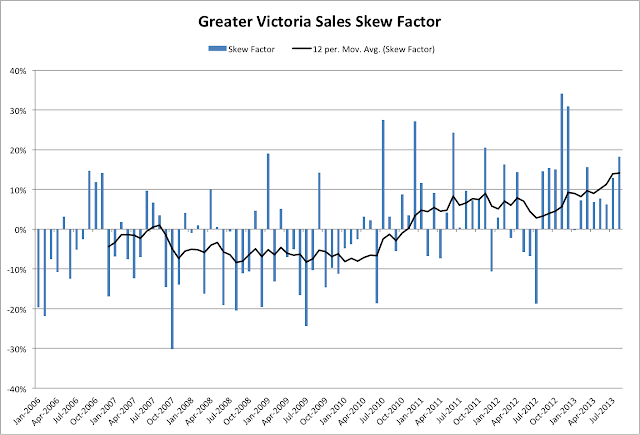 That started some time ago and has left us with a new era of statistical data for Greater Victoria. It doesn't make sense to compare current (skewed) stats to stats in the past that were not skewed. I think it is valuable to start comparing the recent skewed stats to the skewed stats of the past within this new era. I've done some analysis with the higher priced areas (Oak Bay, Saanich East and North Saanich). I've calculated the change in the March and April median vs the July and August median. The result is a -4.1% price drop. 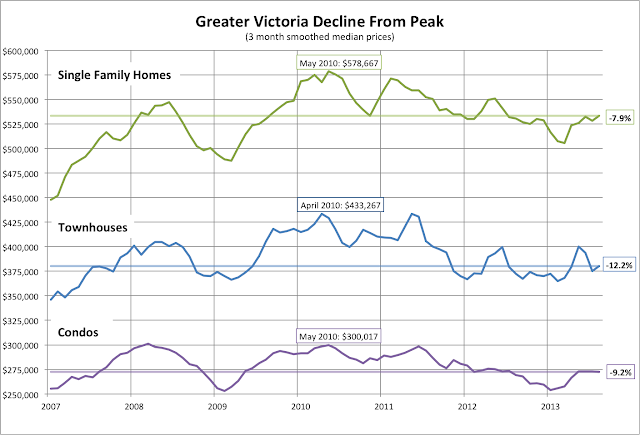 Similarly I've done some analysis for the lower priced areas (Esquimalt, Sidney, Colwood, Langford and Sooke). A similar median comparison yields a -3.6% price drop. For newer houses, let's go with 1998 and newer. My suspicion, and maybe JJ or Marko can confirm or refute, is that houses newer than 1998 are a very small percentage of sales in the core area (depending what you define as core of course). Perhaps too small for reliable analysis? "Also the quality of the data is bound to be quite poor. Yes the newer houses are likely in decent shape (but there are very few of them) but te quality of the older houses will vary wildly and you can't generalize them as the "poor condition" group. Some will be in excellent condition, some will be teardowns"
Ultimately I'd like to compare tear downs with recently renovated houses. However, that data is not available. If my two groups of houses show a marked difference in the price/assessment ratio, then I've proved my point. We will not need a large group of houses in the good condition group, they will be quite homogeneous in terms of lot size, house size, condition, age etc.. 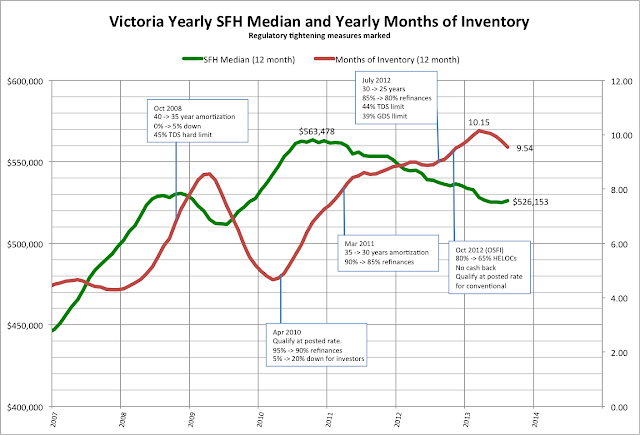 This skewing affect that you have noticed since March, could be very important in showing what happens when a real estate market becomes shallow and dysfunctional - possibly a pre-bust indicator? The way I see it, is that since March people have been trying to buy in the "safer" neighborhoods to protect themselves from a market correction or bust. That inflates some areas and depresses other neighborhoods. And that can really $%^$ up some good analysis. That's an important change in buyer's preferences. And that makes it so tempting to cherry pick what neighborhoods to use in any analysis to get numbers that seem to have meaning. But you lose the big picture of what's happening in the marketplace. You're too busy looking at the sail boats to notice the Titanic roaring past you. I was actually looking through a text book used by the Sauder School of Business on statistics with applications to Real Estate. Absolute crap - there are no references on how to do this or when to use medians or skewing in Real Estate. But then it was written in 1981!!! That's Pre LOTUS 123 !!! It now lays on the floor by the waste basket where I flung it. The age of the home is affected by its condition. A ten year old home may not be updated. But a 30 year old home most likely has been. That could make a 30 year old home as or even more desirable than a 10 year old home. But they rarely tear-down the shacks in this City! There is always some joker with a smart phone and a Home Depot card willing to fix em up! Every guy and his dog seemed to be doing it! And in my opinion, these homes are going to have to be updated again in 10 years. Floors, paint, roof, appliances, hot water tank all to be re-done. I think it;s difficult to compare one month to another month because the data is limited and the range in property types and styles is wide. The data probably looks like a squashed bell curve. At least a 3 month median or even a 6 month median may be more relevant. And for waterfront or acreage you probably could use 3 or 5 years of data before you found anything meaningful. Seems to be a few things coming together here. The credit tightening cuts out first time buyers, the remainder buy into the safer areas in an attempt to avoid a correction, and the correction hits the outlying areas first. Everything comes together for a big shift in sales pattern towards the more expensive core areas. But the bond market has its own agenda. If this insanity keeps up we'll soon be exceeding the rates of July 2011! Happy as I am as a renter, here's one thing I could do without: our ex-property management company in Victoria has mistakenly charged us $2000 rent for a place we've vacated -- and they have done it *three months in a row*, apologizing each time. No names, but rhymes with Bavid Durr. "Bank of Nova Scotia’s chief executive officer Rick Waugh said The Bank of Canada should raise its rates if the central lender is concerned that housing prices are rising too quickly." Uh oh, the debt-addicts won't like this. "“I do not think there is a bubble,” Mr. Waugh said after a delivering a speech at The Empire Club in Toronto on Thursday." Oh, well that's good. If we ignore the bubble it doesn't exist. These are professionals after all. So if they say it's a bubble they are professionals worthy of our un-doubting trust but if they say there is no bubble they are fools? When you compared 2012 to 2013 price/assessment values did you remember to take into account that 2013 assessments were lower than 2012? This is why I prefer to compare this type of data to data from the same year. "So if they say it's a bubble they are professionals worthy of our un-doubting trust but if they say there is no bubble they are fools?" I'm always comparing the sale prices with the latest assessments. Even if I look at sale prices in 2005 they are compared with 2013 assessments. So how does BC Assessment stay within "the range"? 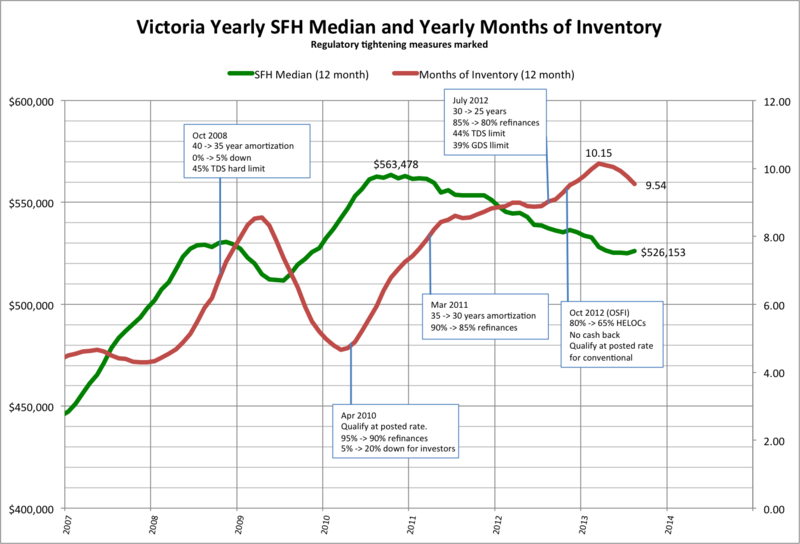 date to look at market sales both before and after July 1st. based on the wider prevailing market trends. actual use of the property to ensure the assessment is correctly classified. Nope, that's wrong. The assessment is for the year the property sold. That messes things up. You could only use the change in the S/A% for periods of less than a year. Or as long as the assessment years have a common denominator. Oh well, back to comparing medians to medians to estimate changing economic conditions. The Economist Magazine (UK) has, once again, made it clear that the Canadian housing market is deep within bubble territory. It states that Canadian housing prices are overvalued by 74% (price-to-rent ratio) and by 30% (price-to-income ratio). Take away third place New Zealand and there isn't anything even close to ballpark after that. The first paragraph of this publication states that "Canada's house prices are bubbly". They couldn't have make it any clearer than that. The Economist, of course, is a completely independent and reputable inernational source, as opposed to biased (fudged?) studies released by Canadian banks, Canadian real estate boards, etc.. Bubble deniers always attempt to discredit any source that provides factual information backing the fact that the Canadian housing market is deep within bubble territory. It wasn't very long ago that Mark Carney declared that the Canadian housing market was overvalued by 37%. The Canadian housing bubble has been blown even bigger since those words were spoken. It's interesting that the Canadian real estate industry still insists that there is no housing bubble in Canada. The US real estate industry did the same immediately before their housing market started to crash in 2006. The study shows that housing prices in the US are currently where they should be, based on incomes and rents. Incomes in Canada and the US are about the same so house prices in the two countries should be the same as well (historically they have been). But they are not. House prices in Canada are about 2x as much as they are in the US. That is why it is impossible to argue that the housing market in Canada is not set up for a crash of historical magnitude. Some people cheer continued emergency interest rates, thinking that it will keep house prices from tanking. The only example of a country that has had sustained emergency interest rates for (much) longer than Canada (that I can think of) is Japan. They are into their third decade of it. You might notice from the study released by the Economist that housing values in Japan are 37% undervalued (rents) and 37% undervalued (incomes). So much for the ability of emergency interest rates to keep housing prices bloated. Japan's housing bubble peaked around 1990. It is difficult to determine the size of that bubble, but the exact size of it is immaterial. A housing bubble is a housing bubble and they all burst and a major, multi-year housing market correction/crash always ensues. The US housing bubble in 2006 was much smaller than Canada's current bubble and the US housing market crashed. In Canada, emergency rates were brought in 4 years ago because of the economic crisis that existed in this country at that time. The fact that the Canadian economy hasn't improved enough to be able to function without even a minor interest rate hike is proof that the Canadian economy is still very weak and fragile. A weak and fragile economy is very bad for house prices. Just ask Japanese homeowners, they'll be able to give you 20 years worth of evidence. The Economist, of course, is a completely independent and reputable inernational source, as opposed to biased (fudged?) studies released by Canadian banks, Canadian real estate boards, etc.. Independent yes, but that doesn't mean their analysis is the correct one. We must examine their methodology just as closely as that of any other group. I've already explained my problems with the economist measure. Comparison to long term trends is fraught with problems. I would like to see all the underlying data and the actual values (rather than relative values) before deciding what to think about their conclusions. What means it's correct is that they correctly identified the global housing bubble and its consequences back in 2005, using the same metrics. Note how the numbers in 2005 show how Canada was behind the US (and Ireland, etc.) on the way up. We will be behind them on the way down. Well, they identified the US bubble. They also point out the Australian bubble and say it appears to be correcting. 8 years later it has yet to correct (and is substantially higher than values in 2005). Australia would have to correct by 30% just to get back down to the values they were at in 2005. The UK, which they also said was very overvalued has flat nominal prices from 2005. Spain crashed, but likely more due to extreme overbuilding than to house prices alone. Anyway, just saying I want to see all the data before I believe it. 70% overvalued relative to rent just does not pass the common sense test. Identifying a bubble when it exists is one thing. A number of economists in the US did that with their housing bubble, Dean Baker, Paul Krugman, Bill McBride, etc. Predicting when it is going to pop is much harder - as that Economist article from 2005 shows. Also predicting how long the correction will take is pretty tough. If Japan is the model then the optimum buying opportunity here might be in the mid 2020's. With realestate sales are often "stacked" with a first time buyer for instance buying a condo, the condo owner buying a townhouse, townhouse owner buying a home, ect. With the recent wave of people buying to lock-in low mortgage rates, has the ripple effect of sales gone through the system yet? On a brighter note, BC did add part-time jobs. With bigger paychecks the ABs & ONs should be able to tolerate higher interest rates. Nice graphs. 15% skew on that last one is nothing to yawn at! Holy Skew Batman! Some segments of this market are down by a third from my records of repeat sales. The fact that the Canadian economy hasn't improved enough to be able to function without even a minor interest rate hike is proof that the Canadian economy is still very weak and fragile. True to some extent, but the bottom line is it will be very tough for the BoC to raise rates till the Fed does even if our economy does strengthen. Our currency is already overvalued and that has slaughtered the economy in Ontario. The biggest reason our currency is overvalued relative to the US - higher short term rates here. Canada currently has one of the higher central bank rates among the developed world. Lower than Canada - Europe, US, Britain, Japan, Switzerland. Higher than Canada - Australia, New Zealand, Norway, Israel. "[Vancouver] is one of the nicest, cleanest, easiest places to live in the world. So people are buying second homes here and with that buy a second car," Stowe said. "So they have a tendency to buy something spectacular." Paper millionaires. Vancouver's unraveling will be a spectacle. What does "independent" in that context mean? That no one owns the economist? That the people who own it or manage it have no economic interests? Does Lady Lynn Forester de Rothschild, Economist executive director, have no economic interests that might influence her judgment, and thus indirectly, the magazine's editorial line? For Info., low interest rates are always "emergency" low interest rates, even when Japan's experience with decades of low interest rates makes nonsense of the idea that low interest rates can have anything much to do with any emergency. But, rather, what we are experiencing now may be the crisis of capitalism that Marx predicted, including a decline in returns to capital, which means permanently low interest rates. If that is the case, people may be increasingly inclined to park their capital in real estate despite the low returns. Luxury cars maybe not. But exotic and rare cars are a way investing money other than real estate. A way of getting money out of a country. This is why you hear the stories of a 20 something son of a foreign national being stopped for driving a $300,000 car without insurance. His father has a dozen of them locked up in the garage. Dad goes back to say China and Jonny finds the keys Dad has hidden and goes for a ride. The banks are to report any transaction over $10,000. Yet someone wanting to move money out of their country can pre pay a debit card by $300,000 then go into a Vancouver car dealer and buy the car on his debit card for CASH. Money is moved - no declaration. Car sits in the garage to be sold later on. Of course the Economist has been known to get it spectacularly wrong as well. Like when they said we were "drowning in oil" and speculated prices could go as low as $5/barrel. What we got instead was a decade long oil bull market and prices that peaked at $150/barrel. Yeah, predictions are difficult, especially about the future — even if you are "independent." So far, among those here, it seems only Dasmo has been consistently correct in their predictions, and they'll be dead wrong just as soon as this bubble bursts! P.S. - looks like 1 sale per 3 realtors if they only sold one unit...bet their bill collectors are at the door. There are two realtors involved in 90% plus of transactions; therefore, around 1,000 realtor transactions for the month and 1220 realtors. Just for info...as some of you know, I track Saanich East sales. Maybe this is telling a story. I appreciate that. I think it shows that there has definitely not been an increase in prices in that area despite improved sales recently. 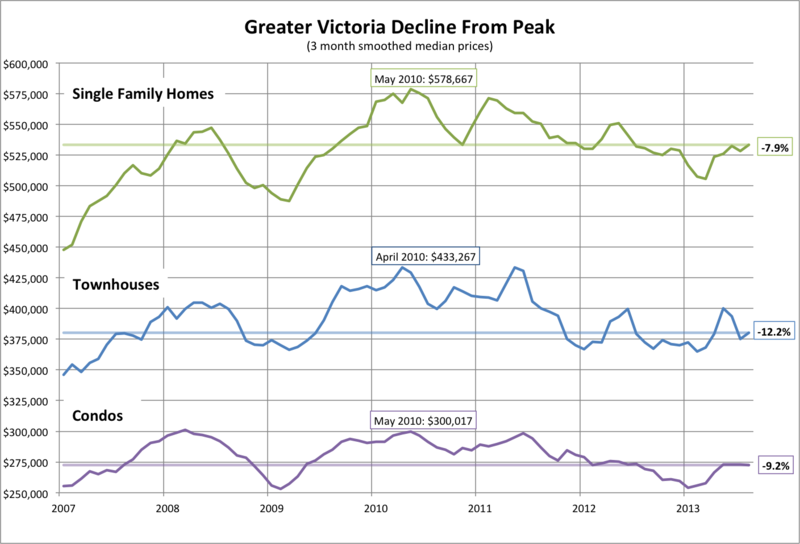 I have found no evidence whatsoever of any price gains in any area of Greater Victoria since December 2012. Even the very generous Teranet Index shows a 1.5% price drop since December 2012. It also shows a 1.5% price drop since October 2012. Year over year, the Teranet Index shows a 4.0% price decline. "Of course the Economist has been known to get it spectacularly wrong"
It would help if you would keep your argument to the housing market instead of oil. To prove that you are right about the Economist being spectacularly wrong, you need to prove that they have been spectacularly wrong with their housing market predictions. "But, rather, what we are experiencing now may be the crisis of capitalism that Marx predicted.. So you are a commie. Well, that explains a lot. Marx did not predict the extreme rise in credit. The crisis of capitalism has been delayed. "Independent yes, but that doesn't mean their analysis is the correct one. We must examine their methodology just as closely as that of any other group." "But to qualify as a bubble, an asset must not simply appreciate; it must decouple from its intrinsic value. For houses, The Economist each quarter compares the ratio of prices to household income and rents against their long-run average (25-year average)". When talking about American cities, the Economist notes that "to be sure, the bubble era dragged that average up". The long term average for countries would also be dragged up by bubble prices. In particular, the long term average for Canada has been dragged up a lot more than most other countries as a result of house prices being in bubble territory for an extended period of time (since the mid 2000s). Taking this into account, it's easy to understand that the Economist's overvaluation for Canadian house prices should actually be more extreme than what was published. Bubble deniers in Canada should actually be happy with the overvaluation published by the Economist. Price-to-rent and price-to-income ratios have been used by governments worldwide for decades to determine the overvaluation of national housing markets. Not long ago Mark Carney used the price-to-income ratio to determine the overvaluation (37%) of the Canadian housing market. It is simple and accurate. Incomes and house prices - it doesn't get any more basic than that. Demographia uses the same basic methodology. Historically, in the US, the price-to-income ratio had been about 2.5 until the mid 1990s. Through the bubble years that ratio increased dramatically, but dipped below 3.0 as the US housing market crashed. Will it go lower? Nobody knows for sure. Interest rates will be rising and that might lead to more price declines. The Canadian housing market will correct back to the point where incomes and rents support house prices. I expect there to be an overcorrection, as is often the case when bubbles correct. The price-to-income ratio of 3.0-3.5 will be restored. When housing bubbles crash/correct, incomes generally do not increase much as the economy is weakened by falling house prices. Incomes will not rise quickly to cut off the crash/correction once it starts in Canada. On the other hand, incomes normally rise much faster than normal during the formation of a housing bubble. Unfortunately for most mortgage holders, the (debt induced) housing bubble days will soon be a thing of the past in Canada. There is no such thing as an intrinsic value to real estate. The long run average price to rent ratio isn't definitive. That ratio is never stable and is affected by hundreds of global and local social, politcial, geographical and economic events. Gold jewellery has an intrinsic value - its weight. But at what price per ounce. Today's or that of 1955. No one is arguing that prices are not expensive. And that prices are not way of line in relation to other times when we had higher interest rates. A duck is a duck - right!? But there is only one way to say with absolute clarity that we have been in a bubble - and that's when it pops. It may walk like a duck, it may quack like a duck, it may even smell like a duck. We aren't arguing that. What we're arguing is what killed the duck. And that duck ain't dinner yet. Your reading comprehension is lacking. I never said that the Economist is spectacularly wrong about Canada's housing being overvalued. While I don't lend particular credence to the exact numbers the Economist comes up with but I would agree that the Canadian housing market is overvalued compared to past norms. I was challenging your argument from authority - "the Economist is an independent, reputable source" therefore you must accept their conclusions. "Independent reputable" sources are frequently wrong once they start predicting the future. The 2005 economist article cited above was remarkably prescient on some things and wrong on others. What was it wrong about? "Country X hasn't had a bust yet" won't do, because they didn't predict when the bust would happen in any country. "What was it wrong about?" If, as seems likely, home prices continue to fall in both countries, spending will be further squeezed. It seems more likely, then, that prices will fall. We haven't had a bust yet because prospective purchasers strongly believe that buying real estate is low risk. As risk falls, prices rise and when the risk of buying real estate is zero then prices can be infinite. If you want to bring prices down, then you have to bring risk or the perception of risk back into purchasing real estate. Or there has to be a better alternative with less risk than real estate. Like another Dot Com thingy to shift people's attention. The BoC, Flaherty and OSFI have tried by talking and warning people. That ain't working - people don't believe them. Sometimes you have to take some one out of a group, and make an example of them in order to motivate the rest to follow you. It really doesn't matter who you chose. They just have to be high enough, but not to high in the chain of command. We need to find our Martha Stewart or Oliver North. I pick Mike Holmes. Someone has to snap that guy's suspenders. Actually anyone from HGTV will do except Sarah Richardson -she's too cute. >> What was it wrong about? "Country X hasn't had a bust yet" won't do, because they didn't predict when the bust would happen in any country. Check out the top line in both of the following data tables from the Bank of Canada. So you are a commie. For a math major, that is a disappointingly illogical inference. Not long ago Mark Carney used the price-to-income ratio to determine the overvaluation (37%) of the Canadian housing market. I do not believe Mark Carney made any such statement. What he did say (in 2011) was that house prices in Canada were "very firm," which is not quite quite the same as "overvalued by 37%." The thing is, prices may remain firm for a long time to come if Treasury bond yields in the 2-4% range begin to look normal, as they did during most of the 19th century. lol Mathematicians deal with the irrational as much as the rational! "I do not believe Mark Carney made any such statement." "Mr. Carney said when it comes to household debt “the message is one of prudence and caution,” adding that the average home price in Canada is about 4.75 times people’s income, while the historic average is closer to 3.5"
So I am fairly sure that he never actually said "Canadian home prices are overvalued by 35% or 37%". However it's not a stretch to say that's what he implied. At the time that would have implied a 26% house price reduction to get back to the historic norm. Who says Canadian real estate is overvalued? Who is the IMF and what do they know that we don't? You are using a time when we were on the gold standard as a model for the future? In particular, the late 19th century saw the Long Depression, the longest period of deflation ever seen. In any case, even a 4% government bond yield translates into a 6% retail mortgage rate. You are using a time when we were on the gold standard as a model for the future? Not exactly. The US did not go on the gold standard until the passage of the Fourth Coinage Act in 1873. But in response to the agitation against that act, the US greatly increased the money supply by printing silver certificates, so the gold standard was not quite what many may think it was. In particular, the late 19th century saw the Long Depression, the longest period of deflation ever seen. The longest period of deflation ever seen until, perhaps, the present period of deflation, already 20-years long in Japan and with no end in sight. The US Gov't bond rate was only 2.9% at the end of the 19th Century and was even lower at the end of WWII (1.7%). So the present rates are not unprecedented and are likely to persist until the deflation induced by globalization, automation and computerization comes to an end. But if deflation continues indefinitely, it will surely impact house prices eventually. LeoM "Who says Canadian real estate is overvalued?" "By the IMF's reckoning, only Canadian houses are more overvalued. (Must be something in that brisk arctic air.)" The neat thing about Canada is you have places that are fairly or even undervalued (AB, Atlantic) and cities like ours that are overvalued. The difference lately is how retirement or second home buyers, that used to bid up Van Isle to such lofty levels, now have numerous other options for up to a 75% discount (US, Atl, Europe) .... and possibly a better retirement lifestyle? The world is transitioning into a quite different environment. Despite desperate measure after desperate measure, a most over-extended global Bubble is convulsing erratically. The economic pie is stagnating - and on its way to contracting. This dynamic ensures an increasingly powerful pull of diverging interests, disagreement, fragmentation and confrontation. The 3 to 4 percent of our population that are actively looking to buy or to sell are those that determine value. And for that 3 to 4 percent, real estate is neither greatly under nor over valued. That some of us use metrics that disregard the effect of interest rates to show how property values are incorrectly valued is simply convient to the cause. What hasn't been shown is that the 3 to 4 percent of the population that are buying real estate today are paying perhaps only a slighly higher percentage of their income than say 15 years ago. Because they may be higher income earners than most of the population and/or have larger down payments from selling a previous home and/or perhaps a gift from a relative. Of course this small group of buyers can not sustain a market forever. But with various government interventions into the marketplace it has been possible to re-vamp the natural real estate cycle several times. "The neat thing about Canada is you have places that are fairly or even undervalued (AB, Atlantic)"
I know for certain that Alberta is overvalued. What numbers do you have for Atlantic Canada? "We haven't had a bust yet because prospective purchasers strongly believe that buying real estate is low risk." That is one factor that should be considered. However, the big picture here is that there is still far too much housing market stimulus in Canada (taxpayer backed mortgage insurance through CMHC, Genworth, etc.) that is, per capita, much more than what the US housing market is receiving, for example. Take away enough of this extreme housing market stimulus and house prices across Canada crash very quickly. Until 2006, house prices in Canada were on par with prices in the US (see chart). The US housing market was in a bubble in 2006. Therefore, the Canadian housing market was also in a bubble in 2006. The Canadian bubble has been blown much bigger since then by extreme housing market stimulus. I know for certain that Alberta is overvalued. " Many ways to prove it. I know you wont like this RBC way, but at least it is current as of Aug 27/13, and their referenced data is sound. fo yo info, Two-storey and Condos are the same over- under- story as the above Bungs : ) ..and what do you know...the only other area they have under its ~30yr average is Atlantic. "As many condo owners who purchased five years ago and are trying to sell today can attest, the equity simply did not materialize. They are often breaking even, or selling for slightly more or less. Today, a condo in Vancouver is no longer viewed as a winning investment, so much as affordable housing and forced savings plan." What? The mantra is not true? Getting into the game at any cost and building equity is not working? But, but, we were promised a bright future for real estate. They lied to us, those bastards. “I’m in a situation where I cannot afford to sell it, so I’m going to be renting it out, probably next month. “For me, it feels as if I am moving backward in life, but I have no choice, because I need to move on because I have a family now. I am going to move out and go rent a basement suite in Coquitlam." The point that is lost on this "professional" is that houses prices are not determined by salaries. They are determined by a buyer's willingness and ability to go into debt. In real terms houses have have appreciated significantly. Salaries... not so much. Will be interesting if we see the sales dip after the ultra low preapprovals expire. I'd say the should be around end of September. I don't think a whole point increase will only result in a 1% decrease in sales but we'll see. "Until five years ago, China’s economy relied remarkably little on debt. But China lost its debt inhibition in late 2008 when the global financial crisis erupted. With growth slowing sharply and 20 million people losing their jobs overnight, the government unleashed a giant stimulus that was powered almost entirely by bank loans. The debt genie was out of the bottle – and it has been extremely difficult since then for China to stuff it back in." The extreme use of debt to stimulate a weak and fragile (crashing) economy. Looks as though China took a page from Canada's book - a book that Canada has been writing since 2000. Exactly. Withdraw the stimulus and the economy returns to crash mode. So what's going to happen for the foreseeable future? More stimulus? Or will it be a plunge into depression? If it's more stimulus, interest rates will, by definition, remain low, so house prices may remain high. High prices do not mean overvaluation, however. An overvaluation is an estimate that exceeds actual value, i.e., what a thing will sell for. By definition, therefore, house prices cannot be overvalued, although they can be "very firm," etc. But even with continued low interest rates home prices may fall (as is already happening with condo prices apparently) because (a) people lose interest, once the market is seen not to be rising, (b) because real incomes decline, (c) there is a demographic change, etc. Thus the future remains obscure. To me anyhow. Contractors and investors have already lost interest in this boring and declining market...too risky and hard to make a profit on an easy facelift and flip. Once the house horny with their locked in 30 day low rates are out then all that's left is us renters...muh ha ha ha !! Maybe y'all will drive rents up? High prices do not mean overvaluation, however. An overvaluation is an estimate that exceeds actual value, i.e., what a thing will sell for. So you'd say that pets.com was not overvalued in 2000, for example? After all, its price was always what it sold for - no need for estimates. You're confusing the meaning of "overvaluation" used in appraisals or assessments with that used in investing. They are different. Overvaluation in appraisals means a price estimate that is too high relative to what it would actually sell for, the latter being the market price. Overvaluation in investing means a market price which is too high relative to earnings. Earnings for RE is rental value. First, I would have to know if other similar companies to Pets.Com were trading at around the same price in 2000 as Pets.com. If they were, then I would say that the "market price" paid for Pets.com was at market value. Otherwise, the purchasers of Pets.com would have "overbought". If they had gotten a deal then the sellers would have "undersold." The terms overvaluation and undervaluation are not used in real estate sales. What a property sells for - is market price. Someone can overbuy or someone can undersell a property. While every property has a market price (assuming some other conditions too) not all sell at market value. Pets.com was the cautionary example that emerged out of the dot.com crash. Lots of new dot.com companies had been created, investors were super excited about them, stock prices soared... but there was nothing backing them up, causing the crash-and-burn of the late 90s. I remember listening to an underwriter on how they estimated the stock value. They determined their best estimate of what the company's sales would be and then capitalized the sales at 10%. Close to complete guess work for Dot.Com companies - in my opinion. Silly me, I asked why 10%. There was no reason at all. They used 10% for all companies. New or established. They never adjusted the cap rate by the riskiness of the venture. In this scenario the underwriters were over estimating the company's sales and under estimating the risk of the venture. The underwriters were guilty of overvaluation not the stock buyers. The stock buyers just believed what they were told. Buyers and sellers are not guilty of overvaluation. And neither are real estate agents when they are working as sales people - they are just being paid to get the best price for their client. When they cross over to providing a valuation for a divorce or an estate, then a real estate agent should make sure they have developed the skill set necessary and that they have enough insurance. Appraisers can be guilty of overvaluation and undervaluation. That's why appraisers are sued - when people lose money because they relied on the appraiser's estimate of market value. I also think CMHC's software program EMILI and some of the Bank's risk assessment software tools were used to circumvent the need of a physical inspection and appraisal and were easily "gamed" by lenders and brokers to get deals made had a significant effect. I suppose it was a case of the Fox guarding the hen house. You shouldn't give the tools to those whose income was derived from how that data is initially input. I'm wondering if those people who bought a home from a lender who used the EMILI program would be successful in court to argue that the EMILI program was flawed and provided an overvaluation of the property. And had the purchaser known about the overvaluation they would have never bought the home. The bank and CMHC therefore had a contributory negligence and can not sue for any loss on a EMILI approved mortgage that is in default. ???? I know that CMHC will not discuss any specifics on how their software program works. They don't want to be called into court to explain the software. A court case that could lead to that software not being used. Big money loss on their side. It is you who are confused. You are confusing a market price with an appraisal. An property appraisal may overvalue a property, but the sale price, i.e., the market value, equals the actual value and cannot be an overvaluation. If you doubt that, check Merriam Webster's dictionary. Thus in the investment world "overvaluation" is a basically meaningless term, a fact not refuted by the example of Pets.com, the price of which might have continued upward if the PR and a few other factors had been working in its favor. Which is to say only in hindsight can an investment be judged with certainty to have been overvalued. Thus talk of current overvaluation is, if not vacuous, entirely speculative. For example, is Tesla overvalued today at $160? I thought it was overvalued when I sold it at $80! If anyone can convince me it is truly overvalued today, I'll short it! I'm wondering if those people who bought a home from a lender who used the EMILI program would be successful in court to argue that the EMILI program was flawed and provided an overvaluation of the property. I don't think so for the reasons indicated in my comment above. EMILI, whatever that is, was by definition providing appraisals, which are merely estimates of market values and must be judged as such, i.e., susceptible to error. Actual as used by BC Assessment is mostly the same as Market Value. Exept Actual Value can be legislated for example land within the Agricultural Land Reserve. The Market Value for the land maybe $200,000 but the Actual Value used for tax purposes is reported at $20,000. There are many definitions for Market Value. But only a couple are accepted by Canadian Courts. Meriam's Dictionary isn't one of them. I suppose it depends if when you're buying your home you placed any reliance on EMILI in formulating your offer to purchase. Since the EMILI valuation is after you have made an offer and it has been accepted - it would be unlikely that you would suceed in a court case. But what if EMILI was used for your line of credit to buy another home?? An issue that we have in Canada is that no one besides CMHC knows the accuracy of the EMILI program. However, if you look at other programs like Zillow or Zoocasa the valuations can be extremely off. A house doesn't have an intrinsic value. Your assumption that you can always rent the home isn't very helpful when the monthly mortgage payment is significantly more than its rental value. Then you have a house you can't sell and you can't rent without taking a big loss. Nor does it guarantee that rents will not decrease and vacancy rates increase as market prices decline. Real Estate was a tangible asset until lenders turned it into an investment vehicle and an ATM machine. That's when it changed from providing shelter to a way of financing, businesses, recreation homes, boats, cars, etc. There isn't much "real" left in real estate anymore. What's the intrinsic value of a car? The scrap value. How much would you get for a new home if you sold it for scrap today. I suppose Nickel Brothers might buy it. That is until their storage space is full. Otherwise how much copper is in the walls? What's the value of used granite or used fibreboard siding these days? I think the small country of Ireland has some 350,000 new or near new homes that are empty, not rented, not sold. Builders and home owners that at one time believed that real estate had an intrinsic value. And don't rely on lot value either. That's subject to market variation too. To use internet parlance: uh...wut? Surely a house has an intrinsic value of, at the very least, the resale value materials used to build the house. I don't understand how a material good with both physical presence and a usefulness to the vast majority of the population could not have an intrinsic value. >> Some of those dotcom companies were literally an empty shell. But you only know that in retrospect. All current multibillion dollar companies were at a point where they were bringing in no revenue and were 100% only potential. The people buying .com companies were buying potential. It didn't work out, but that doesn't mean it's not a valid strategy. "A house doesn't have an intrinsic value." Agreed. Therefore, the only generally understood meaning that can be placed on the term value, with reference to a house, is the price at which it sells. That being the case, it seems meaningless to assert that "housing prices are overvalued," which is why Mark Carney is unlikely to have said that they were. But housing prices can be "overvaluated," to coin a term, where valuations are estimates of market prices. Equally, an investment analyst might think market prices exceed some intrinsic value, but that's the sort of rubbish an investment analyst would use to befuddle the gullible, for as JJ says, houses have no intrinsic value. Surely a house has an intrinsic value of, at the very least, the resale value materials used to build the house. Yeah, about fifty bucks in the case of most houses in Oak Bay. Ireland is not Victoria and Victoria is not Ireland. We don't have their problems. Yet when Ireland was faced with a glut of housing it couldn't solve its housing problem because it couldn't grasp that properties had no intrinsic or tangible value. The politicians and the people believing that those 2,000 and 3,000 square foot empty homes will one day again sell for tons of cash. So they hired the big national building companies that built them to maintain them until the market returns. But if you believe the way I do, then it makes economic sense to demolish these empty homes. The have no intrinsic value anyway. Instead pay people to demoslish them then later pay people to rebuild them in order to create an economy. Thereby reducing the supply of homes, and encouraging new construction and new jobs in the future. Because what the people need in Ireland is jobs before they can buy houses. So will it be in our future to pay Len Barrie to demolish Bear Mountain and CITA to crush half of Sooke? At least CMHC when it buys out the bank mortgages should have a program to demolish some of the poorly maintained homes. Possibly allowing the use of them as garden city lots. CS, you agree that it exists then. I wasn't arguing anything about what that value should be, just that it exists, which is contrary to what JJ was saying. I think what Jack was saying is the intrinsic (actual) value of a house can go to zero same as a tulip can. Detroit is an example. That would make sense - if the argument is that the intrinsic value exists, but is near zero, that's a fine argument to make. Maybe I'm just being pedantic. If everyone or close to that already own a home - what value is it to them to own another and another and another. Someone crossing the desert may pay a hundred dollars for that first glass of water to quench their thirst. But will not pay a lot for the second or third glass. Here’s another example of a home with zero intrinsic value I know because a friend was just given one that looks identical. He did have to have a beer with the guy. Would it be your argument that intrinsic value exists - but no one can measure it or tell you what it is? Hey, that looks like a classic Boler. If you know anyone else giving one away lemme know! I'd prefer say it exists, but stop there. If you were saying "does not exist" to imply a number small enough to ignore, then I don't have nearly as much of a problem with that. I'm not saying I agree, it just resolves the issue I was having understanding what you were saying. Please. The intrinsic value of a house is the earnings which it can bring to its owner as a business, i.e. a rental. It has nothing with what it cost the builder or owner. I think we can all agree on at least that. If any of you are interested in learning about the basic concepts of stock or other asset valuation (which are not based on what you think the next buyer or buyer of a similar asset is going to pay), try googling "fundamental value". Judging from the conversation to this point, I doubt it. "Price is what you pay, value is what you get." - Warren Buffett. Monday market update: is it still raining?